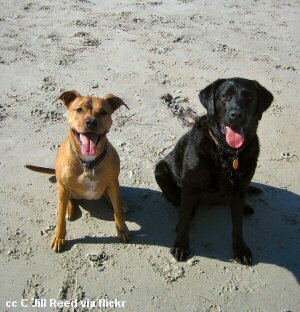 Dog Friendly Beaches - Everybody loves the beach! Especially dogs! Finding a beach that allows dogs, though, isn't always easy. 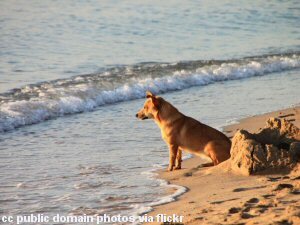 Here's a easy to use resource for finding dog beaches in Central California. Dogs and beaches seem to go together. It is a joy to see a pooch chasing the surf, digging in the sand or just enjoying the exhilaration of being able to run without fences. There are a number of beaches here in Central California where you and your dog can take in the soothing atmosphere that is uniquely found at the beach. 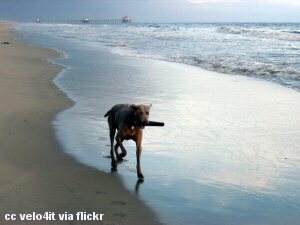 There are even a few beaches where your best friend can enjoy the surf leash-free. Something's in there, I just know it! 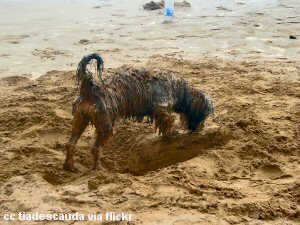 Before we get to the list of beaches, it is necessary to cover basic dog etiquette. Now these are things that you already know and follow, but just for safety's sake we'll restate them. 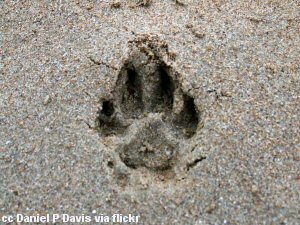 Some beaches which previously allowed dogs have now banned them mainly because some people ignored these simple and courteous rules. The California State Parks (and some other beaches) require you to have proof of rabies vaccination for your dog. It's a good idea to keep it with you. There are a number of Central California beaches where dogs are banned. It is not a spiteful thing, nor rules which haven't been well thought out. The main reason dogs aren't allowed on these beaches is the Snowy Plover. This little bird is listed as threatened. Their preferred nesting sites are sand spits, dune-backed beaches, beaches at creek and river mouths, and salt pans at lagoons and estuaries, all of which describes a fair amount of the beaches in the southern section of Central California. 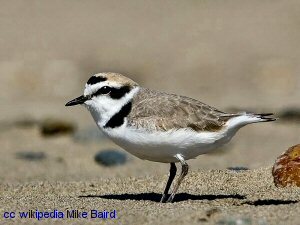 The plovers scrape little nests right in the sand from March to September which is when access is limited on these beaches. Avila Beach - Fisherman's Beach San Luis Obispo No No AKA "Dog Beach"
Pfeiffer Beach Monterey Yes No A great beach, but hard to find. Be sure to check out the link to the left for directions. Garrapata State Beach Monterey Yes Yes This State Park was scheduled to close on July 1, 2012, but will stay open with volunteer and other public sector assistance. Monterey State Beach Monterey Yes Yes Dogs are allowed only South of the Monterey Beach Resort hotel. Moss Landing Beach Monterey Yes No This is NOT Moss Landing State Beach which is north of the harbor entrance. No dogs are allowed at Moss Landing SB. Directions: Highway 1 to Moss Landing Road; right on Sandholdt Road to Salmon Way then left to parking area. As you can see from the table above, there are quite a number of good beaches which you can enjoy with your dog. Be sure to bring some fresh water and a dish for your dog. Drinking sea water will make them sick. Enjoy your time at the dog friendly beaches! Can't we stay just a little longer!? Please! ?